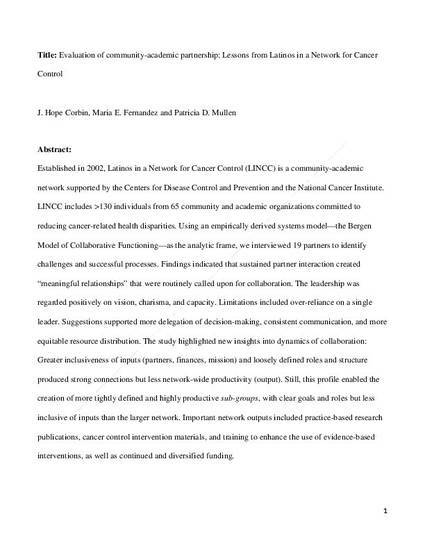 Established in 2002, Latinos in a Network for Cancer Control (LINCC) is a community-academic network supported by the Centers for Disease Control and Prevention and the National Cancer Institute. LINCC includes >130 individuals from 65 community and academic organizations committed to reducing cancer-related health disparities. Using an empirically derived systems model—the Bergen Model of Collaborative Functioning—as the analytic frame, we interviewed 19 partners to identify challenges and successful processes. Findings indicated that sustained partner interaction created “meaningful relationships” that were routinely called upon for collaboration. The leadership was regarded positively on vision, charisma, and capacity. Limitations included over-reliance on a single leader. Suggestions supported more delegation of decision-making, consistent communication, and more equitable resource distribution. The study highlighted new insights into dynamics of collaboration: Greater inclusiveness of inputs (partners, finances, mission) and loosely defined roles and structure produced strong connections but less network-wide productivity (output). Still, this profile enabled the creation of more tightly defined and highly productive sub-groups, with clear goals and roles but less inclusive of inputs than the larger network. Important network outputs included practice-based research publications, cancer control intervention materials, and training to enhance the use of evidence-based interventions, as well as continued and diversified funding.